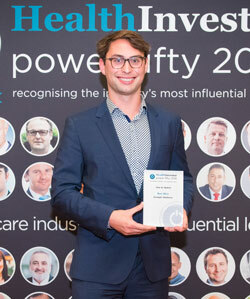 HealthInvestor is delighted to continue our partnership with Kingsley Healthcare for the ‘One to Watch’ shortlist and Award, which was presented to the sector star of the future. The One to Watch shortlist was chosen by the Power Fifty themselves, through a blind ballot. The winner of the 2018 One to Watch award is described as someone who is “making a real difference” in health and social care. Ben Allen – founder and chief executive of Oomph! Wellness – was recognised by Power Fifty members as an individual with “an incredible amount of energy”, who in four years has built up a business with over 150 client companies in health and social care. Oomph! operates in over 1,000 locations and will attract more than one million participant sessions to its well-being services this year. Oomph! recently launched its new mini bus service ‘Out and About’ which is already taking 15,000 residents on days out per year – this number expected to double in 2019-20. Ben is the chairman of The Care Workers Charity where he has been instrumental in developing its turnaround strategy and supporting its execution. The Care Workers Charity won Change Project of Year at this year’s Charity Times Awards. Ben is a co-founder of the Care Innovation Challenge which is an accelerator backed by the Department for Health and Social Care. HealthInvestor UK is the leading magazine and website for investors, operators, lenders and advisors focused on the UK health and social care sector. Our team of experienced journalists provide readers with the latest market news and analysis through our website and monthly magazine.